Ph.D. student Marie-Lou Gendron-Marsolais and professor Julie Hlavacek-Larrondo, from the Centre for Research in Astrophysics of Québec (CRAQ) and Université de Montréal, have joined the developers of SITELLE, Laurent Drissen and Thomas Martin from Université Laval, an instrument recently installed at the Canada-France-Hawaii telescope (CFHT), to reveal for the first time the intricate dynamic around the galaxy NGC 1275. Located 250 million light-years from earth, NGC 1275 is not an ordinary galaxy. It sits in the middle of the Perseus galaxy cluster, a gigantic cluster harboring thousands of galaxies in the constellation of the same name. 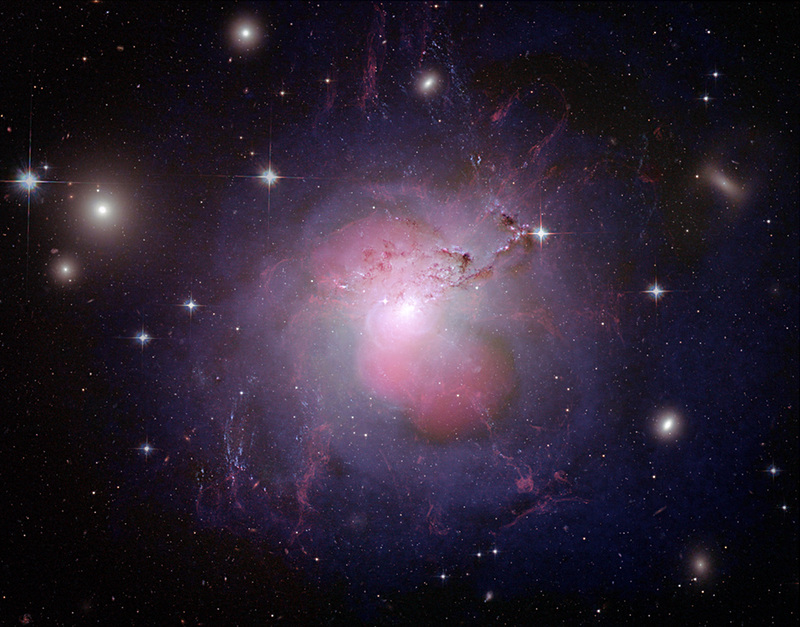 NGC 1275 rests at the center of a hot and diffuse intracluster gas with an average temperature of tens of millions of degrees. 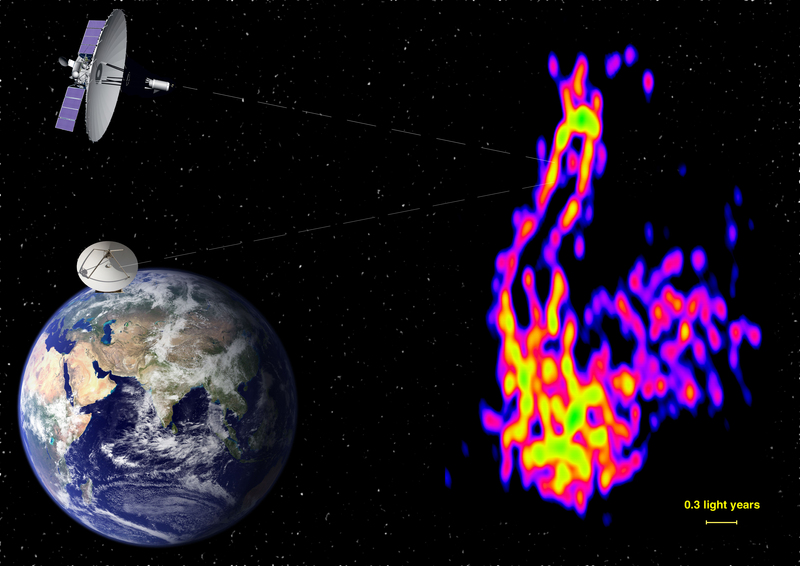 This complex gas constitutes a large part of the luminous mass of galaxy clusters: the hot gas tends to cool and fall toward the galaxy while the central supermassive black hole releases powerful jets of energetic particles. These particles blow gigantic bubbles in the hot gas, preventing it from cooling. Astronomers generally dectect these bubbles by using radio radio telescopes. 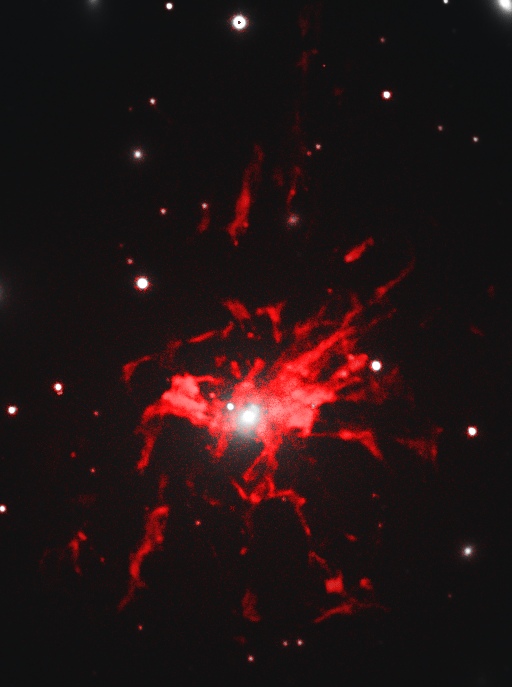 However, a spectacular network of thin intricate filaments surrounding the galaxy NGC 1275 is visible at specific optical wavelengths. “These types of filaments are often visible around galaxies that lie in similar environments… but their origin is a real mystery”, declares Marie-Lou Gendron-Marsolais, lead author on the paper. Extending over 250 000 light-years, two to three times the size of our own galaxy, the link between this large network of filaments and its environment is still unclear. Two theories are in conflict: the filaments could be condensing from the hot intracluster gas and sinking toward the center of the galaxy or being lifted by the bubbles created by the central supermassive black hole jets and dragged outward of the galaxy. In order to unravel the mystery of these filaments, the international team of researchers have used SITELLE, an instrument at the Canada-France-Hawaii Telescope that enables the imaging of the galaxy at several different wavelengths at the same time. “This way we obtain a spectrum for each pixel of the image” declares Julie Hlavacek-Larrondo, a coauthor on the paper. “But what is unique about SITELLE is its incredibly large field of view, covering NGC 1275 in its entirety for the first time since the discovery of the nebula, 60 years ago”, she adds. 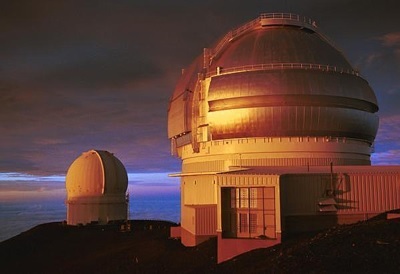 Installed at the top of Maunakea on the Big Island in 2015, SITELLE is the product of the expertise of a team led by the astrophysicist Laurent Drissen as well as the optical design specialist Simon Thibault, both professors at the Faculté des sciences et de génie of Université Laval, as well as the knowledge of CFHT and the high-performance technology business ABB. With a spectra for each pixel, it is now possible to obtain the radial velocity of each filament, revealing their dynamics at an unprecedented level. “The motion of this network of filaments seems to be very complex. It does not seem to be from a uniform motion, rather it is extremely chaotic”, declares Marie-Lou Gendron-Marsolais. The team is convinced that such observations will help illuminate the mysteries of these structures. Understanding the filaments’ dynamics aids astronmers in the understanding the processes of heating and cooling of the gas feeding the central black hole. Unlocking this process constitutes a key element in the study of galaxy evolution and, at larger scale, of environment such as clusters of galaxies. The results from the work led by Marie-Lou Gendron-Marsolais, Julie Hlavacek-Larrondo, Laurent Drissen, Thomas Martin and their international collaborators are published in a letter of the latest issue of the Monthly Notices of the Royal Astronomical Society.